Imelda Sayavedra was born in Benavides, Texas on July 21, 1938. She passed peacefully into Heaven’s gates on June 28, 2018. A consummate wife, mother, grandmother and educator, Imelda enjoyed spending time with her family, entertaining friends, and was an avid reader. Imelda enjoyed a wonderful life with her husband of 58 years, Leo Sr. Together they traveled and experienced the world. Imelda’s greatest memories were spent with her children Imelda, Leo Jr., and Diana along with her grandchildren Soledad, Leo III, and Kristoph. She enjoyed long and special friendships that she maintained throughout her life. She had an open heart, was quick to smile, and made time for all who needed her help. Imelda received a degree in education from Texas Women’s University (TWU), and a Certificate of Library Science from Sam Houston State University in Huntsville, Texas. 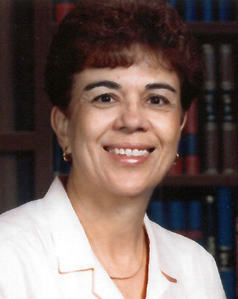 She was an excellent teacher and librarian devoting 35 years of service to the field of education, during which she positively impacted the lives of thousands of children. After retirement, she continued to serve children as a volunteer in schools, and served on the Boards of the Children’s Museum of Bryan/College Station, and the Girls Club of Bryan/College Station, receiving the “Women Who Make a Difference” award in recognition of her dedicated volunteer activities in the city. Imelda is survived by her loving husband of 58 years, Dr. Leo Sayavedra. She is also survived by her daughter, Imelda Salazar; her son Leo Sayavedra Jr. and his wife Laura Sayavedra; her daughter, Diana Sayavedra; her grandchildren, Soledad Isabel Sustaita, Leo Sayavedra III, and Kristoph Thomas Sayavedra; her two sisters, Isabel Galvan (Fernando), and Idalia Mendiola (Luis); her two brothers, Martin Gonzalez (Mary Ann) and Mario Gonzalez (Marta) along with a number of nieces and nephews. She was predeceased by her parents, Martin and Estefana Gonzalez, and her sister Irma Gonzalez. The family will receive friends on Friday, July 6th, from five to eight o’clock in the evening at the Bradshaw-Carter Memorial & Funeral Home, 1734 West Alabama Street, Houston, with the rosary being recited at 7 o’clock. A memorial mass celebrating her life will be held Saturday, July 7th, at 1 o’clock in the afternoon at St. Anne Catholic Church, 2140 Westheimer Road, Houston, Texas 77098.